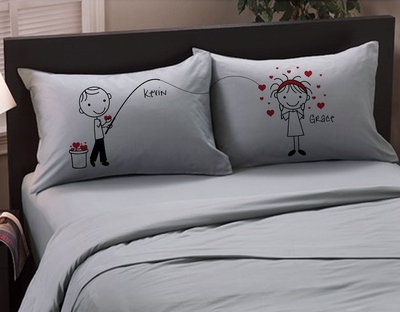 Fishing for Love Cute Personalized Pillowcases. Standard Size Pillowcases are also available in Cream or Ash Colors besides White. Choose the color and size options on the pulldown menu and enter personalizing for the Boy side and Girl side and then add to cart. MATERIAL: Super soft hi-tech microfiber material which is eco-friendly as it dries 50% faster than cotton. PRINT PROCESS: the design is permanently dyed into the fibers of the fabric so it will not crack or peel or have a rough feeling in any way. FABRIC CARE: wash in warm or hot water, color safe bleach, tumble dry on low. This fabric is wrinkle resistant so no need to iron if you take the pillowcases out of the dryer right after the drying cycle finished. If you do prefer to iron them, just use a cotton based cloth and cover the image are with it and then iron over it to protect the image itself. PACKING: The item is packed in a gorgeous organza bag so it is suitable to send as a gift directly to the recipient as it's packaging is classy and delicate. DESIGN: ©STOCKING FACTORY - We are the sole designer and manufacturer of this design.